Figure 1. GPS radio-collared adult male mountain goat in the Clear river drainage on Baranof Island. Baranof island harbors a unique mountain goat population. In 1924, mountain goat were transplanted to the island from Tracy Arm (south of Juneau) due to the belief that mountain goats were not present in the area. However, recent genetics research has revealed evidence suggesting that mountain goats may have always been present on the island and survived the last glacial maximum in a small “cryptic” refugia on the southwestern end of the island (a contention supported by historic Russian fur trade era documents). Thus, the current population is composed of 2 distinct genetic lineages (the Tracy Arm lineage and the “endemic” lineage). 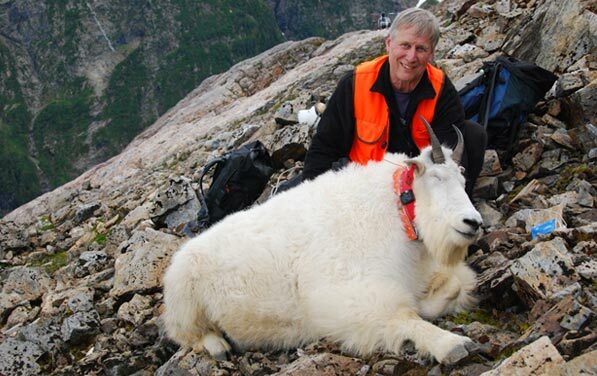 The mountain goat population on Baranof island is generally productive but in recent years high levels of harvest of female mountain goats has resulted in population declines in local areas, particularly in popular hunting areas directly accessible from Sitka. Current research has focused on gathering detailed field data related to population size, reproduction, survival and habitat selection/movement patterns in order to inform management strategies for this recovering population. 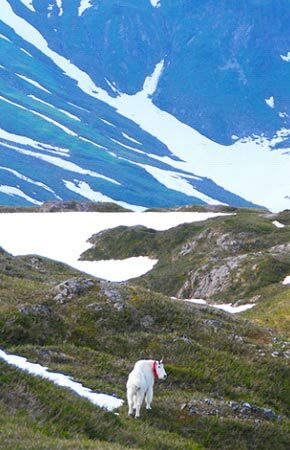 Since 2010, 31 mountain goats have been captured and marked with GPS radio-collars; monitoring these animals is a central aspect of research studies on Baranof island. In addition, expansion of hydroelectric projects on the island are predicted to inundate mountain goat winter range in the Blue Lake area. Research objective also include collection of data needed to precisely assess the extent to with mountain goat winter range will be affected by development activities. Future plans to expand the hydroelectric network across the island to the Takatz Lake area also require detailed information about mountain goat spatial and population biology to assist with planning and mitigation efforts. Shafer, A. B. A., K. S. White, S. D. Cote, D. W. Coltman. 2011. Deciphering translocations from relicts in Baranof Island mountain goats: Is an endemic genetic lineage at risk? Conservation Genetics 12:1261-1268. White, K. S., P. Mooney and K. Bovee. 2012. 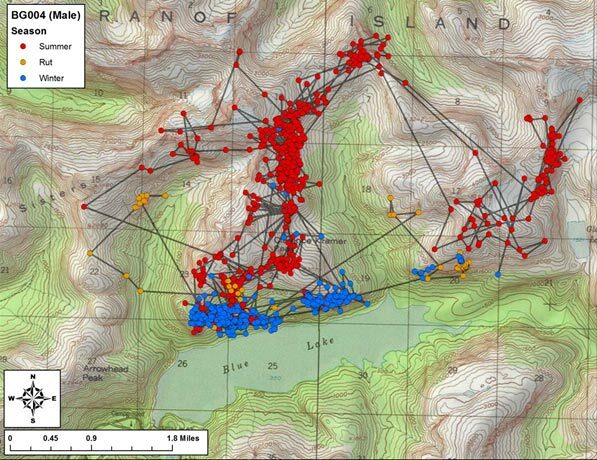 Mountain goat movement patterns and population monitoring on Baranof Island. Research progress report. Alaska Department of Fish and Game, Juneau, AK. Figure 2. Seasonal movement patterns of a GPS radio-collared male mountain goat illustrating utilization of winter range habitat near the shore of Blue Lake; near area proposed to be inundated via hydroelectric development. Figure 3. Sitka Area wildlife biologist, Phil Mooney, handling an immobilized male mountain goat on Baranof Island. Figure 4. 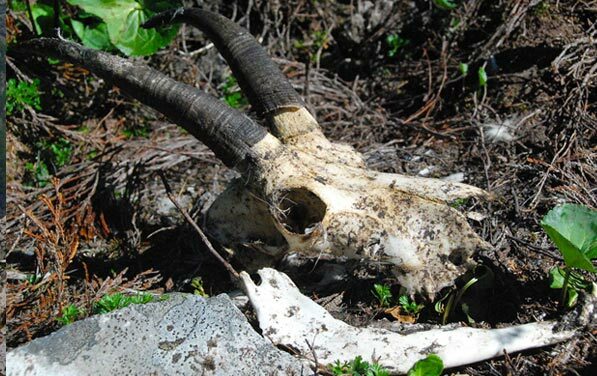 Remains of 14-yr old male mountain goat that died during the winter of 2012. This was the oldest male mountain goat yet documented in southeast Alaska research studies (1 year shy of the North American record).